Israeli soldiers invaded, earlier Monday, the village of Orif, south of the northern West Bank city of Nablus, kidnapped four Palestinians, and confiscated two cars, a lathing machine, and a power generator. 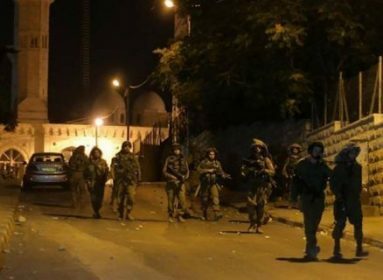 The Nablus office of the Palestinian Prisoners Society (PPS) has reported that the soldiers stormed and violently searched many homes, and kidnapped four Palestinians. The PPS said the kidnaped Palestinians have been identified as Sa’adi Najeh Safadi, Najeh Sa’ad Najeh Safadi, Ali Najeh Sharif Safadi and Essam Najeh Sharif Safadi. The soldiers also confiscated two cars, belonging to Ali and Essam, in addition to confiscating a lathing machine and a power generator. On Monday at dawn, the army invaded ‘Aida refugee camp, north of Bethlehem, searched several homes and kidnapped two teenagers. The soldiers also assaulted and injured a Palestinian from Jenin. In related news, the soldiers continued their strict siege and collective punishment on Sa’ir and Bani Neim towns, in the southern West Bank district of Hebron, for the eleventh consecutive day, and kidnapped six Palestinians. Also on Monday at dawn, several Israeli military vehicles invaded Palestinian agricultural lands, east of Khan Younis city, in the southern part of the Gaza Strip.